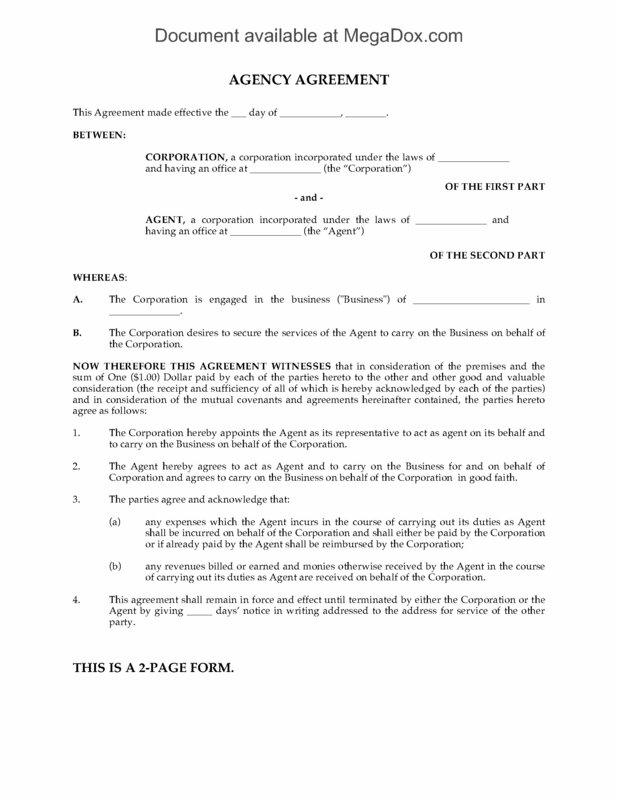 Appoint an agent to operate your business with this standard form Agency Agreement template. The agent is not acting as an employee of the company, but will run the affairs of the business as the representative of the company. This type of contract is ideal for a business that does not wish to franchise but is looking to expand into a new territory without the expense of setting up premises and hiring staff in the new location. All revenues received by the agent will be remitted to the company without deduction. The agent will be reimbursed for its expenses in carrying out its duties. This is a generic common law contract which does not contain specific references to the laws of any country or jurisdiction. 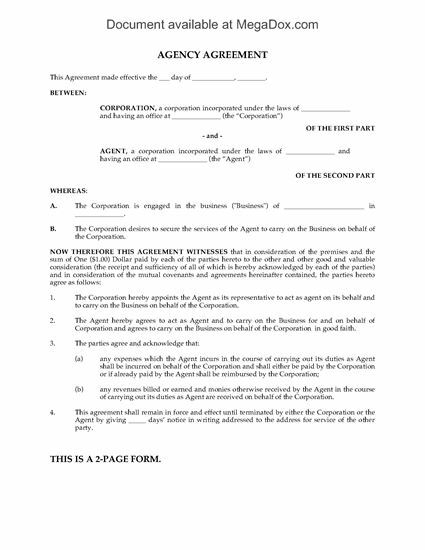 The Agency Agreement form is a MS Word template which can be easily modified to fit your unique needs. 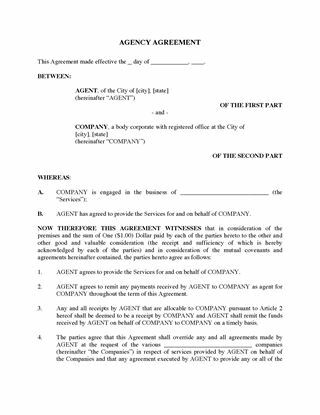 Hire an agent to perform specific services for your company with this downloadable Agency Services Agreement template. The agent must remit all money it has received on the company's behalf. The agent will be paid a specified fee for its services, plus reimbursement for any approved expenses. The Agreement will automatically renew unless canceled by either party. This is a generic legal form which can be used anywhere. 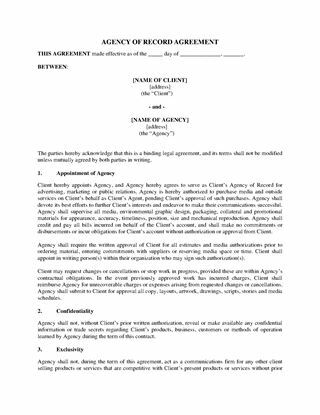 The Agency Services Agreement template can be easily customized to fit your circumstances. Canadian suppliers, appoint a distributor to act as your sales agent within a specified territory in Canada with this Sales Agency Agreement. The Agreement contains wording for either an exclusive or non-exclusive agency appointment, whichever is applicable. The sales agent will do marketing, solicit orders (from end users only), collect accounts receivable within the territory and provide the supplier with quarterly sales forecasts. The sales agent is an independent contractor, and will not give any warranties, undertakings or guarantees which involve responsibility or liability on the part of the supplier. The sales agent agrees not to compete with the supplier within the territory during the term of the Agreement and for a specified period of time after termination. This Canada Sales Agency Agreement is a downloadable MS Word template and is fully editable to fit your circumstances. If your business operates in more than one location around the United States, you may need the assistance of an agent. 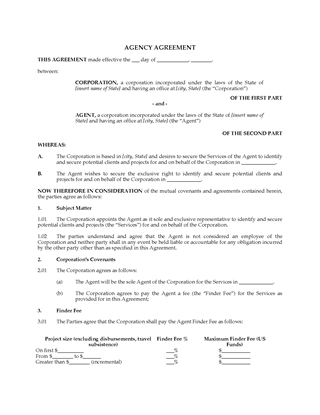 Hire one to work for your company with this Agency Agreement. The agent will perform certain specified duties and collect money on the company's behalf. All funds received by the agent under the Agreement are received on behalf of the company and must be remitted to the company. The agent will be paid a fixed fee, plus reimbursement for expenses incurred in the performance of its duties. You can obtain your copy of the USA Agency Agreement by adding it to your shopping cart and checking out with the payment option of your choice. Hire an agent to identify new markets and projects in other countries with this Agency Agreement to Identify Prospective International Clients for USA companies doing business abroad. The agent is hired on an independent contractor basis. Finder's fees will be paid to the agent on a sliding scale, based on the dollar value of the specific project. The agent is bound by confidentiality and nondisclosure provisions. The agent will provide administrative services, arrange housing and transportation for company representatives. The agent will provide customs clearance, and expedite delivery of documents to the company during the course of negotiating and obtaining contracts. The USA Agency Agreement to Identify Prospective International Clients is provided in MS Word format, and is fully editable.